This is the second article on fitting and LED lighting solution in my workshop. The first article covered the light levels that I’m hoping to achieve. This article discusses LED ribbon which is a both cheap and easy to work with. In my humble opinion LED lighting and LED ribbon in particular is one of the wonders of modern world. When I grew up lighting was either incandescent or, if you were in a shop or factory, straight florescent tubes. I probably wouldn’t even have been able to imagine that you could cheaply buy a rolled up strip of lights that used just a few watts of power. LED ribbon is a strip of flexible plastic with circuits sandwiched in the middle and LED’s mounted on top as shown below. It comes in a wide variety if different shapes, sizes and specifications but there are a few that are much more common than others. Lets start with naming, I call it LED ribbon or LED tape but it also gets called LED strip, LED string, LED roll and I’m sure a dozen other names – it’s all the same stuff. Most of the LED ribbon sold today is designed to run off a 12V supply but you can also get hold of 24V fairly easily and some other voltages if you shop around. LED ribbon can be bought in a wide range of colours and numerous white temperatures. Unfortunately it’s a bit hit and miss with white temperature and you’ll often only see it listed as warm or cold. Where a temperature is given it usually can’t be relied upon to be accurate, if temperature matching is important buy all you’ll need at the same time. If that wasn’t enough choice you can also get kits that come with a controller that allows you to choose the colour and intensity of the ribbon. Since coloured LED ribbon isn’t the focus of this article I’ll not discuss it further here except to say take care when buying colour changing ribbon. There are two basic types of colour selection ribbon, one has discrete coloured LED’s and other has all the colours in a single chip. The discrete variety is good for colour washing a large area but wouldn’t work well for up close use. The LED’s used on LED ribbon are called SMD or Surface Mount Device which is just a fancy way of saying they attach directly to the ribbon like a microchip would. This is in contrast to regular electrical components that have leads. 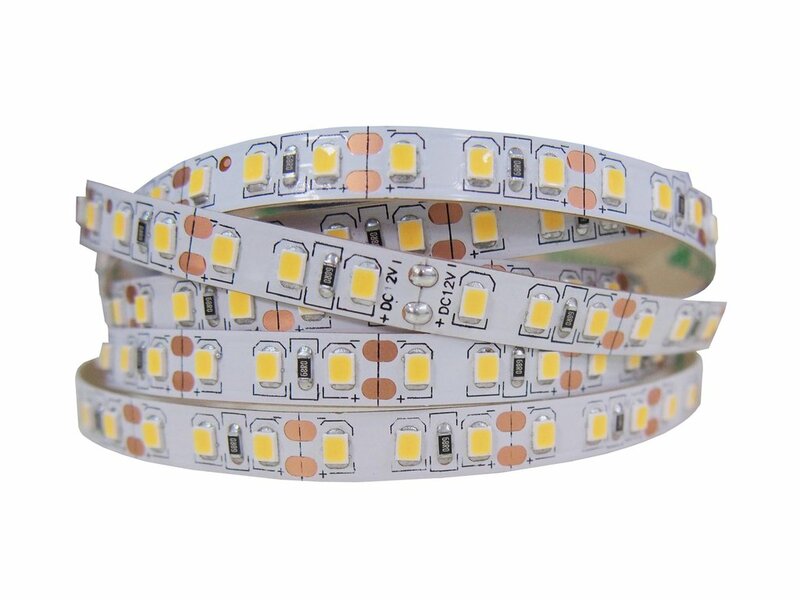 There is a wide range of SMD LED’s available but only three are commonly used on LED ribbon: 3528, 5050 and 5630. The figures indicate the size of the LED package in mm so a 3528 is 3.5mm x 2.8mm. How much light each chip outputs seems to vary greatly with manufacturer and the quality of the LED. A 5630 will output about twice as much light as a 5050 which will in turn output about twice as much as a 3528. Typical figures are given in the table below but these could be way off and depend strongly on how hard you are driving the LEDs. LED ribbons can be bought in various lengths but 5m is the most common sales unit if you are buying from abroad. In fact the ribbon is so cheap now that you will often find you’re paying a significant premium for the shorter lengths. Buying a full reel isn’t a problem as it can easily be cut down to length. Width varies depending on where you buy from but 10mm is quite common. If you have 12V ribbon it is usually broken up into repeated parallel wired sections of three LEDs and a current limiting resistor wired in series. The 24V ribbon is the same design but will have six LED’s per series section. It’s normally safe to cut the ribbon at the end of each series section and the ribbon will be marked where you can cut. If you examine the ribbon you’ll usually find it’s actually made up of lots of short runs all soldered together. I’m not sure why it’s manufactured this way, it seems unnecessarily complex. LED ribbon can be bought with varying numbers of LED’s per meter. Common per meter LED counts are 30 and 60 but some of the smaller LED packages can also be found at 120. Occasionally you’ll also find 180 and 240 LED’s per meter but they are comparitively rare. 30 LED/m – often sold as “150 LED” – only 3528 and 5050 commonly available. 60 LED/m – often sold as “300 LED” – all common chips sizes are easily available. 120 LED/m – often sold as “600 LED” – generally only 3528 available. 180 LED/m – rare, seen with 5630 chips. 240 LED/m – rare, only see with 3528 chips. I think that covers just about everything you need to know about LED ribbon. In the next article I’ll discuss powering the ribbon and doing some calculations to find a power supply.